Lower back pain is one of the most common symptoms that patients are diagnosed with. Over 80% of the population will experience lower back pain at least once in their lifetime. The most common culprits are: muscle strains, injuries, or overuse. Back pain could also be a symptom of more serious conditions such as a herniated disc, osteoarthritis, spinal stenosis, etc. 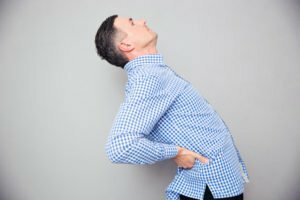 Pain management is usually assigned to patients with chronic back pain, which is defined as a pain that lasts for over three months, and/or pain that is caused by tissue unable to be healed. Back pain management could be a very effective alternative to surgery. But in order to reach full potential, it requires the patient to be determined, committed, as well as knowledgeable about their situation. There are three types of pain management that are used to treat lower back pain: non-invasive non-drug pain managements, non-invasive pharmacologic pain managements and invasive pain management. Non-invasive non-drug pain management techniques include exercises, manual techniques, behavioural modification, superficial heating/cooling of skin, and electrotherapy. While exercises to treat back pain may seem counterintuitive, they are instead very beneficial. Although strenuous activity should cease as soon as a patient experiences back pain, this should only be a temporary action. Over time, resting after experiencing lower back pain can impede healing. Therefore, after a certain amount of time, active back exercises are essential for mending the spine and lower back region. Manual techniques such as manual physical therapy differ from conventional treatment methods due to the treatment’s use of hands as opposed to devices or machinery. In this specific therapy, practitioners use their hands to put pressure on muscle tissue and manipulate joints, in an attempt to decrease back pain caused by muscle spasm, muscle tension, and joint dysfunction (Robert Daul). More information on these techniques can be read in the article, “Pain Relief through Manual Physical Therapy and its Various Techniques”. Behavioural methods such as cognitive therapy aim to ease patients’ pain by relaxation techniques, coping techniques as well as many other methods. It involves learning to control muscle tension, blood pressure and heart rate for symptomatic improvement. Superficial heating/cooling of skin involve the use of cold packs, hot packs, ultrasound, and diathermy (the use of high-frequency electromagnetic currents to produce heat and apply it to affected lesions). This kind of therapy should be used along with exercises. The most widely used type of applied electrotherapy used is transcutaneous electrical nerve stimulation (TENS). TENS therapy reduces back pain by stimulating the sensory nervous system via electrodes with low voltage currents in the affected area. A patient can select the amount of frequency current, as well as several different stimulation patterns from a variety of options provided by a hand held controller. The effectiveness of this therapy is varied for each individual; to some, the results were beneficial and positive and to others, the results were neutral and provided no effect. Analgesics, pain relieving medication, which can include acetaminophen. Nonsteroidal anti-inflammatory agents (NSAIDs) including aspirin, ibuprofen, naproxen, and COX-2 inhibitors. Muscle relaxants, which are used to treat muscle spasms as a result of back pain. Narcotic medications, which serve as an anaesthetic and are not used for chronic conditions but more so for acute or post-operative pain. Neuromodulating medications, which are used to treat neuropathic and muscular pain. Antidepressants and anticonvulsants, which are also applied to treat neuropathic pain. Note: extended or long-term use of most medications mentioned above may increase health risks. Injections are often temporary pain relief methods resulting from a direct administration of steroids or anaesthetics into joints, ligaments, muscles or around nerves. This method’s results could also be used to identify or confirm a diagnosis of a suspected region of pain. Prolotherapy involves injecting an irritant solution in order to cause an inflammatory response. This event stimulates blood circulation and ligament restoration, thus encouraging natural healing to occur. Radiofrequency radio ablation essentially involves administering heat to specific nerves in attempt to disrupt pain signalling to the brain, therefore eliminating or greatly diminishing the pain. Surgically implanted electrotherapy devices include implantable spinal cord stimulators (SCS) and peripheral nerve stimulators. This method is generally used when a patient’s back pain was not relieved via These SCS implants send mild electrical currents along the spinal cord in order to disrupt signalling to the brain, thus minimizing the feeling of pain. Implantable opioid infusion pumps are responsible for transporting opioid substances (or narcotics) directly to the spinal cord and therefore relieving the pain.